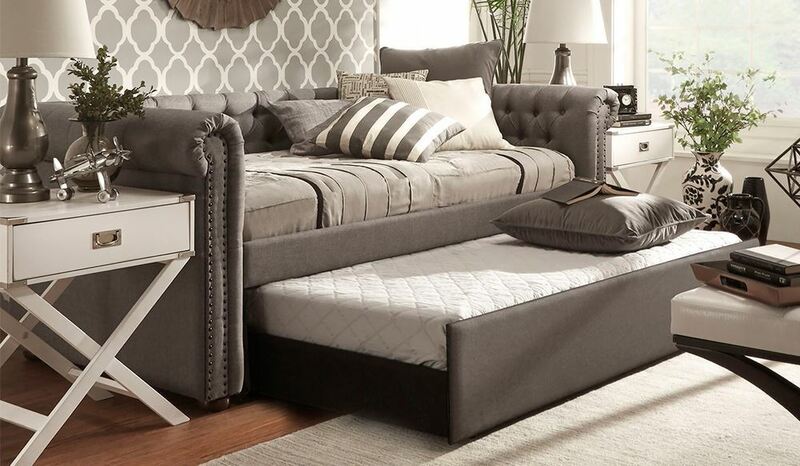 Loungeable seating meets additional sleeping space with the Inspire Grey Upholstered Daybed. Made of plywood, foam, and solid wood, this set is everything you need in a room that's short on space. Wrapped in a neutral grey linen color, its versatile enough to mesh with nearly any existing set-up, making it an ideal option for a youth bedroom, a living room, or a den. We love how the button-tuft detailing, rolled arms, and nailhead trim give this functional set a darling, chic aesthetic. Ensuring full on practicality, style and comfort, the Inspire Grey Upholstered Daybed is what dreams are made of. Loungeable seating meets additional sleeping space with the Inspire Grey Upholstered Daybed. Made of plywood, foam, and solid wood, this set is everything you need in a room that's short on space.